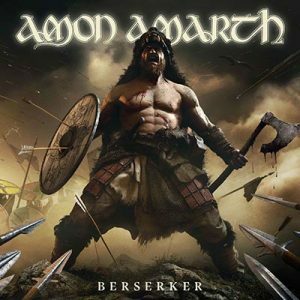 Album Review: ‘Berserker’ by Amon Amarth – Spotlight Report "The Best Entertainment Website in Oz"
Formed in 1992, Amon Amarth are a Swedish melodic death metal band who take their name from Tolkien’s Sindarin word for Mount Doom. 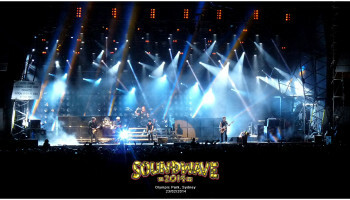 Often mistaken for a part of the “Viking metal” genre, the band are known for their lyrics that deal largely with Viking history and mythology, a theme they fell into mostly by accident before realising it suited their style and helped them stand out. Their 11th studio album, Berserker takes the band to new heights, with irresistible melodies and even more explosive riffs. I couldn’t help but admire the sheer talent, creativity and ingeniousness that went into the creation of Amon Amarth’s newest entry to their discography. Berserker is truly a masterpiece, with the beautiful and thematic intro and powerful riffing of opening track Fafner’s Gold, combined with vocalist Johan Hegg’s deep and melodious growling kicking the record straight to eleven and it’s hard to believe they can sustain it, but sustain it they do. Mjolner, Hammer of Thor opens with a killer riff and really shows off the band’s metal chops and deals with one of the hottest topics of today: Thor (obviously). 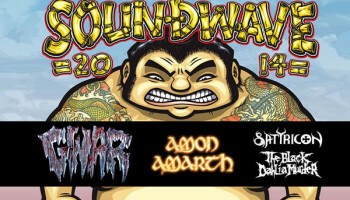 It was this song that had me desperate to experience a larger-than-life live Amon Amarth show. One of the most intriguing parts of the Viking mythology for me, is the concept of the Valkyrie, women who choose which slain warriors can go to Valhalla, so for me I was especially keen to hear Valkyria, both beautifully melodious and wonderfully heavy, it was not a disappointment and was one of my favourite songs on the record. With the semi-title track The Berserker at Stamford Bridge, Amon Amarth give us a vivid and powerful historical tale, taking us back to 1066 and the Vikings’ heroic last stand against the English. Ravens have a significant role in Norse legends, as a symbol of Odin’s favour and victory in battle, and in the record’s first single Raven’s Flight, a furious and furious fast-paced song set right on the battlefield, our metal warriors are preparing for war. Confident of their victory, the song urges us to feel what these men are feeling: With Odin’s help we cannot fail / We hold our heads up to the sky / And know that we will never die / As long as we stand side by side / As long as we can see the ravens fly. Raven’s Flight is the first of a trilogy of music videos from Berserker, with each one getting more epic, featuring a cast including Josh Barnettas “the Berserker” and Erick Rowan as “Thor”. With Berserker, Amon Amarth deliver what they promise: a melodic death metal take on the era of the Vikings which creates a dramatic atmosphere and transports their listeners straight to the battlefield. 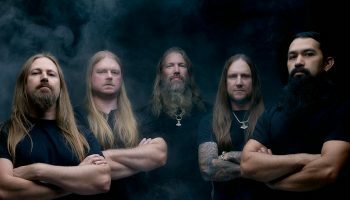 May is set to be a big month for them with the release of Berserker set for May 3rd.. Amon Amarth will also be embarking on a North American tour alongside Lamb of God, Cannibal Corpse and Slayer as part of Slayer’s final world tour.